First Hill is not an easy place to get groceries. “When word got out we were looking at the neighborhood as a possible location for a new Stockbox, we were pretty immediately swarmed with community support from people on First Hill,” said Carrie Ferrence, CEO of Stockbox Neighborhood Grocery. 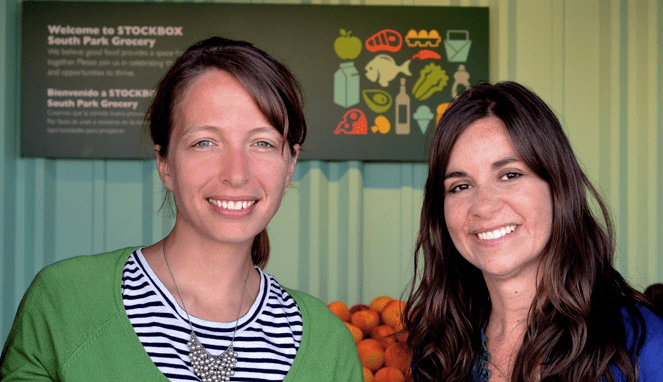 A grocer with a mission, Stockbox started out as a culminating project on sustainable economy between students at the Bainbridge Graduate Institute. The idea was to bring fresh produce to areas of the city suffering from “food deserts,” or a measurable dearth of nutritious food providers. The project manifested initially as a produce truck in Delridge and, for a time, in a transformed shipping container. “Our team was adamant about testing this model in the real world—creating small format grocers with fresh produce so every community has access to good food,” Ferrence said. Stockbox’s first store in the Seattle area opened in South Park in summer 2012. By November, it had already announced a slate of changes based on buying behavior and customer requests. The company continues to be involved with civic issues related to the availability of nutritious, affordable food in lower income and urban areas of the city. The produce at the First Hill location will come from Marra Farms, an organic community garden in South Park. Officials from King County’s Harborview Medical Center invited Ferrence and her team at Stockbox to take a look at a space on their campus on 9th and James late last year. At 2,000 square feet, the First Hill grocery will be a much more densely packed version of the giant footprint required for big grocery chains like QFC and Safeway but larger than its South Park iteration. It will focus on fresh, locally sourced milk, meat, produce, grains, and “grab and go” meals. You can get a peek at the design rendering for the new store here. While its workday population teems, First Hill’s residential population hasn’t kept up with the rest of Seattle’s downtown core, growing “only” 8% between 1990 and 2010. Depending on how you draw the neighborhood’s borders, there are still thousands of residents to serve — and more to come as the Yesler Terrace area at the southern end of Broadway is prepared for massive investment and changes. Stockbox is planned to open mid-August, but in the meantime, Ferrence wants to let the community know that the design process for the new grocer will be very open. “We are very much about creating an open dialogue with customers on price points, what brands they want to see stocked, and just overall an understanding of what’s missing in the community that we can help provide,” Ferrence said. Members of the community interested in adding their input can email firsthill@stockboxgrocers.com, or hop on the group’s Facebook and comment. This entry was posted in Food & Drink, News, etc. by kelton_sears. Bookmark the permalink.